My beautiful bride of 20 years and I just spent three days in Seattle to celebrate one of our favorite things: marriage. We have loved being married. Sherri and I took it easy and enjoyed getting time for just the two of us to talk, pray, eat, walk, and take in the wonderful west coast. We decided to go into the city and visit the famous public market. 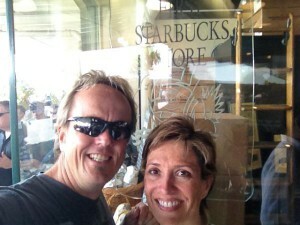 I wanted to get a cup of coffee from the very first ever Starbucks. We also ate some amazing clam chowder and enjoyed the smells and sights of the market. One place in the market area is the Pike Place Fish Market. They have every kind of seafood right out in the open, on ice ready for sale. The employees are full of the chants and boisterous calls to come buy some fish. One of the things they are most known for is if you buy a fish, they will throw it across the store front counter. Flying Fish! It was fun. Funny. What was really interesting to me is how many people stood with cameras ready to try to capture this throwing of the fish. They surrounded the area waiting, waiting, and then taking video to try to capture this thing they heard about even though they had no interest in actually buying a fish or maybe they don’t even like fish. They wanted to see something amazing, unique, special. They were willing to wait for it. They had heard it would happen. People had talked about it. Rumors were out there. Hey, my friends, we who follow Jesus carry the Kingdom of God in us. The Holy Spirit actually dwells in us! There are so many people in our lives who know these things about us and are watching us to see what makes a life with Jesus so amazing. How does it make us different? So many of us live in a lie that says we are too messed up or not faithful enough to be used by God to show His amazing Glory and Power. It’s not true. Scripture say the good work He began in us He will bring to completion. It’s not a mediocre work or an average thing; it’s good! God’s good things are always amazing. They’re never boring. But if we choose to fold or listen to the voice telling us we’re not qualified or ready to show God’s Kingdom, evil wins. Really. Edmund Burke says, “The only thing necessary for evil to triumph in this world is for good people to do nothing.” When we do anything for the Kingdom of our awesome God, amazing things happen. Sometimes slow, sometimes fast but always amazing! And people are waiting and watching. Those people are your friends, family, coworkers, classmates, people on the street, children in poverty, orphans, neighbors, and fellow parishioners sitting next to you on Sunday morning. Let the fish fly, children of God! You really are amazing by God’s grace! !